Figure 1 Schematic of a trimer of TNF-P in which the polypeptide trace of P-strands are depicted as arrows and loop segments as tubes. 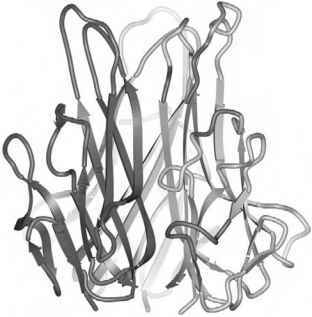 Residues that bind to TNF-R1 are red. The membrane-proximal surface of the trimer, as bound to TNF-R1, is located at the bottom of the diagram. identity to TNF homologs that would establish an evolutionary relationship (although sTall does assemble into an icosahedral cage). On the other hand, TNF family members have distinct sequence similarity and obvious structural homology to trimeric, globular C1q domains  of the het-eromeric molecules that function in the complement pathway. Hence, the TNF and gC1q domains may share an ancient kinship in the early development of the immune response. Tumor necrosis factor monomers associate through a conserved girdle of hydrophobic or aromatic amino acid residues that encircle a trimeric axis of symmetry. Beta strands at the edge of the outer P-sheet of each monomer contact an extensive surface of the inner sheet of the adjoining molecule (Fig. 1). 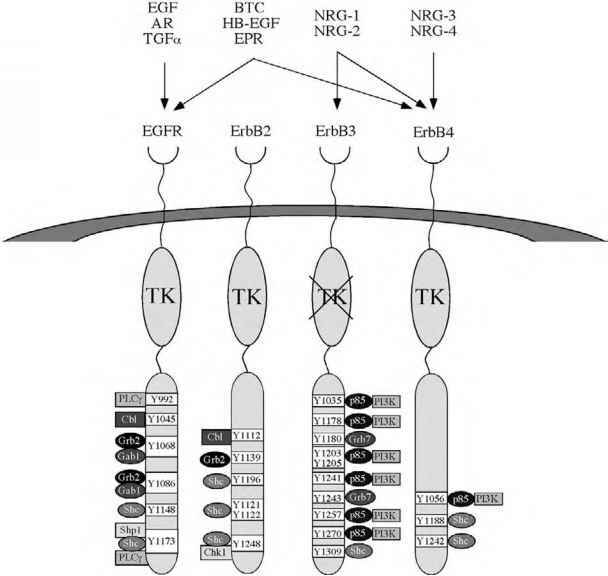 TNF-a and other homologs possess a disulfide cross-link between connecting loops that may confer stability to the molecule in the extracellular environment but is unlikely to serve a role in receptor recognition.